You know, I've always told him (Larry Brown) I wanted the relationship that Michael Jackson... Michael Jordan, I'm sorry. … I wanted the same relationship with him like Phil Jackson and Michael Jordan had. Allen Iverson's slip of tongue during 2001 MVP press conference. Reporter: Could you be clear about your practicing habits since we can't see you practice? Reporter: So you and coach Brown got caught up on Saturday about practice? Iverson: If I can't practice, I can't practice man. If I'm hurt, I'm hurt. I mean … simple as that. It ain't about that... I mean it's... It's not about that... At all. You know what I'm saying I mean... But it's...it's easy … to, to talk about... It's easy to sum it up when you're just talking about practice. We're sitting in here, and I'm supposed to be the franchise player, and we in here talking about practice. I mean, listen, we're talking about practice, not a game, not a game, not a game, we talking about practice. Not a game. Not, not … Not the game that I go out there and die for and play every game like it's my last. Not the game, but we're talking about practice, man. I mean, how silly is that? … And we talking about practice. I know I supposed to be there. I know I'm supposed to lead by example... I know that... And I'm not.. I'm not shoving it aside, you know, like it don't mean anything. I know it's important, I do. I honestly do... But we're talking about practice man. What are we talking about? Practice? We're talking about practice, man. [laughter from the media crowd] We're talking about practice. We're talking about practice. We ain't talking about the game. [more laughter] We're talking about practice, man. When you come to the arena, and you see me play, you see me play don't you? You've seen me give everything I've got, right? But we're talking about practice right now. We talking about pr... [Interrupted]. Reporter: But it's an issue that your coach continues to raise? "Allen Iverson news conference transcript". CNN/SI. May 8, 2002. I don't know any franchise players that come off the bench. I don't know any Olympian that comes off the bench. I don't know any All-Star that comes off the bench. I don't know any former MVP that comes off the bench. I don't know any three-time scoring champion that comes off the bench. I don't know any first team All-NBA (player) that comes off the bench. 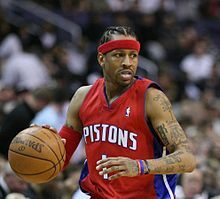 Why Allen Iverson? Allen Iverson's reaction to being benched by Sixers coach Chris Ford in April 2004.